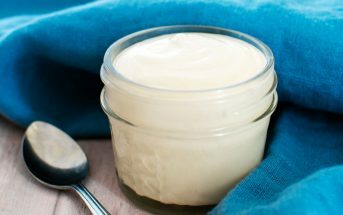 Did you know that non-dairy whipped toppings can contain milk protein (casein), and most do? It’s been a long time coming, but So Delicious has finally released a truly dairy-free whipped topping called CocoWhip! In fact, they went above and beyond with CocoWhip, using all-natural and mostly organic ingredients; producing it free of the top allergens (yes, it’s soy-free, too! ); shunning carrageenan; getting it certified gluten-free, vegan, and kosher parve; and releasing it in two varieties: Original and Light! 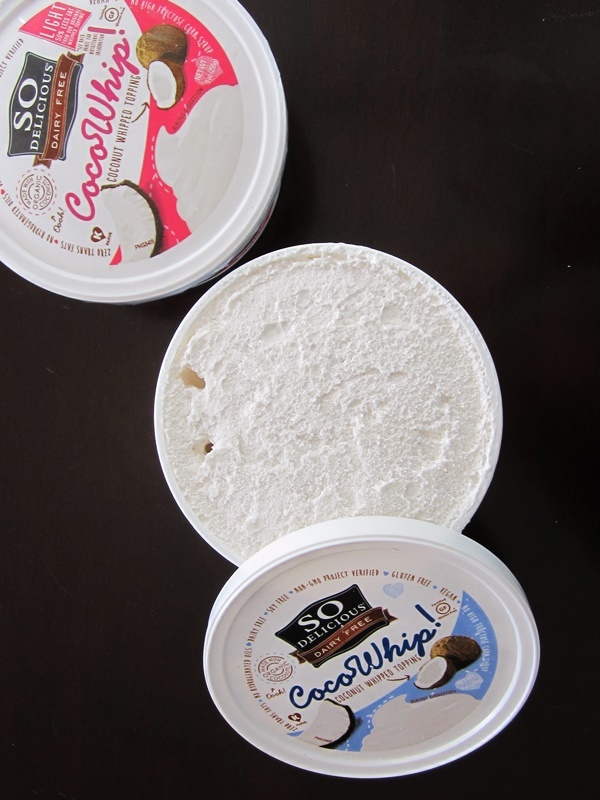 We received a package of each CocoWhip variety, and doled out samples to get opinions on this new dairy-free whipped topping. Holy fluffiness! Aerated to near perfection, this chilled topping impressed us for its very light yet creamy consistency. The flavor of CocoWhip is delicious, but definitely quite sweet and indulgent. I had to ask another if Cool Whip is that sweet, and they confirmed that the two are similar. Though I didn’t see vanilla in the ingredients, CocoWhip did strike us as slightly vanilla, and didn’t seem to shout coconut. We didn’t get the chance to test CocoWhip in some of those Kraft-style recipes, like cream pies (I’ll have to buy some later for that! ), but did find that CocoWhip is great atop cooled pies (like pumpkin!) and think it would be marvelous on cake, ice cream sundaes, parfaits, in sandwich cookies, etc. The only caveat is that it didn’t perform well when dolloped atop a freshly cooked dish. 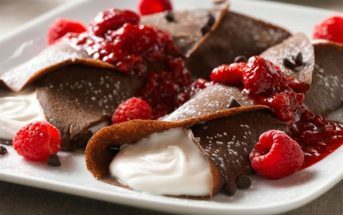 Rather than melting into creamy puddles atop our warm dairy-free crepes, it almost fizzed away and dissipated. This wasn’t a deal breaker for me, since I do prefer cooled desserts, but it may be problematic if you like hot apple crisp! 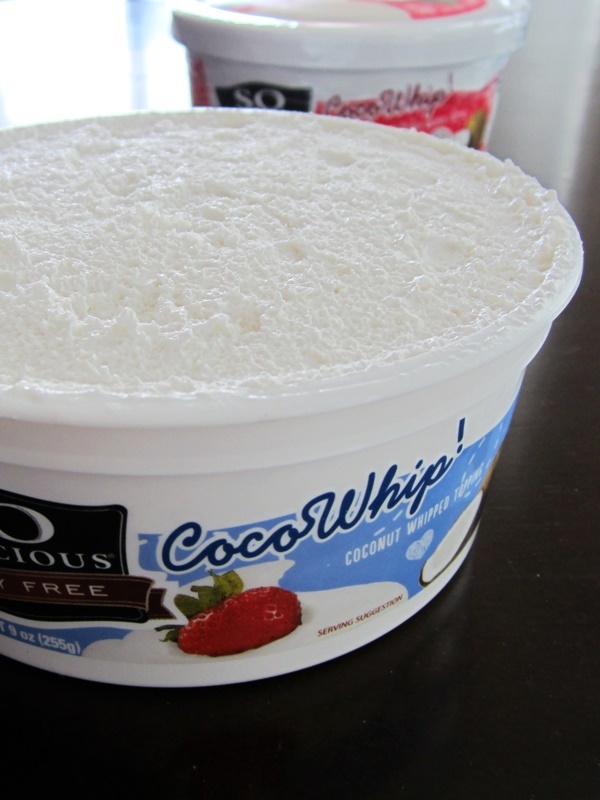 In reality, 2 tablespoons of CocoWhip Original has just 30 calories, 2 grams of fat, and 2 grams of sugar. But considering that many of us will likely indulge in more than 2 tablespoons at a time, CocoWhip Light may be a good option for some. It has 25 calories, 1 gram of fat, and 3 grams of sugar per 2 tablespoon serving. Unfortunately, the Light didn’t hold its structure like the Original. It seemed almost a bit melted and lacking structure. It’s possible that this could have resulted from the shipping, so I’m planning to purchase a tub when in stores (very soon!) to give it another trial. Thankfully, since I’d rather consume more fat than sugar (and found the Original sweet enough! ), Original CocoWhip will probably be my go-to regardless. And overall, I was impressed. 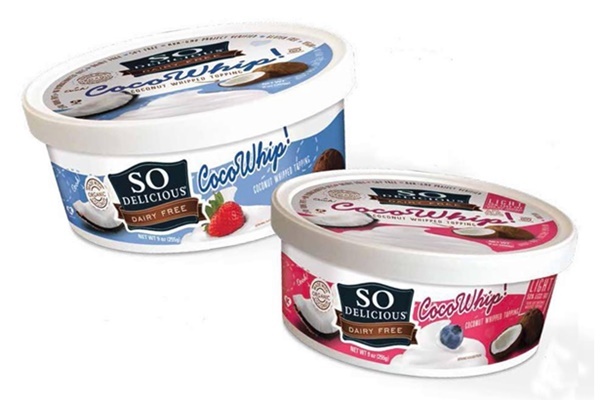 CocoWhip dairy-free whipped topping is so close to Cool Whip in taste and consistency, but with far better ingredients and without a drop of dairy! Certifications: So Delicious Dairy Free CocoWhip Topping is Certified Gluten-Free, Vegan and Kosher Parve, and Non-GMO Verified. Dietary Notes: By ingredients, o Delicious Dairy Free CocoWhip Topping is dairy-free / non-dairy, egg-free, gluten-free, grain-free, nut-free, peanut-free, soy-free, vegan, and vegetarian. Nonetheless, always read the ingredient statement and check with the company on their manufacturing processes for all varieties if potential allergen cross-contamination is an issue for you. Processes and labeling are subject to change at any time for any company / product. So good! I love to pair up with ice cream and pretty much any dessert. It is truly delicious. If you like the taste of coconut, then you will really enjoy Cocowhip! So close to Cool Whip, it’s uncanny! But, CocoWhip is truly dairy-free (yes, “non-dairy” topping actually contains dairy! 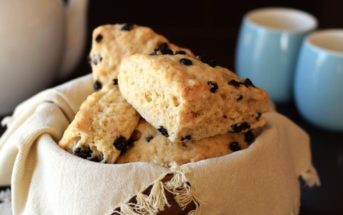 ); certified gluten-free, vegan, and kosher parve; and made with organic ingredients. You can enjoy generous dollops of sweet creamy and very fluffy indulgence from the Original tubs. It’s delicious atop cakes, pies, sundaes, parfaits, and should perform in cool recipes. However, it doesn’t tend to melt nicely atop warm desserts and we found the Light version to be lacking in whipped fluffiness. Still, we had to give the Original 5 stars for fulfilling an overlooked dairy-free desire. What stores sell this, I only have Kroger, Walmart and Meijer’s near me. They rolled CocoWhip out to Whole Foods first, but I believe it will gain distribution in the major stores in the year ahead. This is one of my son’s favorite things. He takes two homemade cookies or Enjoy Life cookies and puts this in between for dessert. It is one of our household “staples.” We have only found it a Whole Foods. That sounds amazing! I’m going to have to try this. Who else will carry this product in Central California? Will Ralley’s or Savemart carry it too? I’m not sure, but they might eventually. You can check with them to see if they can order it in. WOW! And I will say it again – WOW – Best product I have discovered in 2015! I LOVE ice-cream, but I can’t eat it because I am lactose intolerant. It’s been years since I had real ice-cream down my tummy, which is great for my diet, but I am allowed for a cheat day. If it wasn’t for the dairy in ice-cream, I would indulge in cheating with some ice-cream. I looked for dairy free ice-cream online and ran into cocowhip blended with frozen fruits recipe – what a great idea! I thought it was too good to be true, and perhaps maybe the cocowhip would taste strange on its own, But NO! It taste delicious. It’s the BEST thing EVER! It’s as good as Crest’s new sense-strips! Now that is a review! Thanks for weighing in Maria and so awesome to hear that you enjoyed it so much! We like it, too, and I hope it will be stocked even more this summer! I found this at my local Whole Foods today. It is amazing! A great dairy-free, healthier alternative to Cool Whip. I have not tried it thawed yet, but I ate a few bites of it frozen and it was delicious! So far, so good!!! That is high praise! Thanks for sharing Beth. I came across it at a Whole Foods in NJ over the weekend when I was there to buy a gluten free crust to try out. They were in the same frozen case. I tried it on the pumpkin pie that I made using the So Delicious culinary light coconut milk. I think that the original version is a very good substitute for Cool Whip. I will buy it again. This stuff is SO GOOD. I got it from Whole Foods last month 🙂 I made an Oreo Freezer pie already and I have my friends munching on it, asking for more. Where can I find this??? In SF Bay Area? Hi Diana, it is in Whole Foods. Next year they’ve said they will start shipping to other stores. Thank You, Thank You, Thank You. I am sooooo very happy. I can’t wait to try your Coco Whip. Where can I get it? Hi Donna – this is a third party unbiased review, I’m not affiliated with the company. That said, I checked with them, and it is still rolling out to Whole Foods across the U.S. It is in some stores already, but should be in most by month end. They will ship to other stores (outside of Whole Foods) starting next year. I really can’t wait to try this whipped topping! Soooon, I hope! I was disappointed that they didn’t have any for us at the Food Allergy Bloggers Conference. 😉 Thanks for the review, Alisa! I know! It is already in some Whole Foods’ regions – so it’s coming! Oh yay! This looks awesome!